Are you looking for some CSS3 buttons, which are good enough to be used in real-world website projects? here are some CSS3 buttons you might like. Since my last post about codepen buttons, I’ve been searching sites like codepen, cssdeck and jsfiddle for some good practical buttons and I’m amazed to find so many cool CSS3 buttons with nice effects and animations. Here are some wonderful buttons I’ve picked, which I think are cool and practical and can be used in your web projects. Some buttons here do use jQuery, but not too lavishly to mess-up everything. 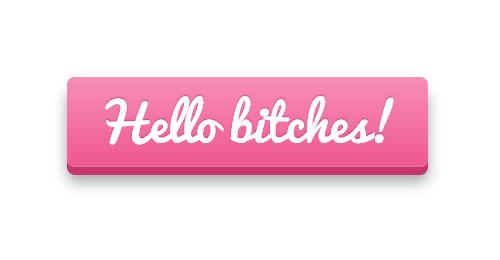 Nice 3D pink rectangle button uses CSS3 transition effects. Other than small jQuery code to play the sound and change inner text, it’s entirely made using pure CSS3. Collection of 3D buttons, created only using CSS3. The buttons were inspired by freebie PSD Chunky 3D buttons. Nicely done social buttons only using CSS3 and icon font. Circle animated buttons with CSS3 background patterns. Might not work in Firefox 3.6 and IE10. Another circle animated buttons, but this time, the text rotation on mouse hover gives really nice effect. Another example of circle CSS3 buttons. Nicely created Toggle buttons, entirely created using CSS3 and icon font. A nice looking 3d button created using CSS3 and Google fonts. Buttons demonstrate cool animations using different CSS3 properties. We are now absolutely sure that we can easily create shiny buttons only using CSS3, no more photoshop. It’s pretty amazing what you can do with CSS3 pseudo elements :before and :after. Checkout amazingly done 3d buttons. 3D flip button effect on click, created only using CSS3. No effects or animation, just collection of popular brand buttons using CSS and bootstrap icons. A circle button inspired by this dribbble shot example. Small jQuery code to give blob effect on click. A Switch inspired by dribbble shot, created only using CSS3. A collection of flat buttons for all occasions, no animation or effects. Much nicer version of social share buttons, only nonfunctional. As per author it should work in IE7+. CSS Christmas button using data:urls, a method to embed the image data directly into the document. A round shiny button using CSS3. Buttons only uses unicode symbols, you can also use text or icon fonts. Another set of 3D animated buttons for websites. Animation is done using theanimation and keyframes properties. Collection of CSS3 metal button, the symbols were created with the help of “pictos” font by using @font-face. Box-shadow and linear-gradient properties were used to create metal look. Another collection of rounded animated button created using CSS3. Buttons uses simple CSS3 properties like gradients, box-shadows, text-shadowsetc. Hover and active states are also included in this set. Nice CSS3 buttons. The HTML and CSS codes are much more usable in real world projects. This 3D download button uses perspective transform to make the button look 3D which works only in webkit browsers. These social buttons use liner-gradient as the base background, box-shadow for 3D effect, the icons are the result of data:URI. A big fat shiny CSS3 button with a shadow effect beneath it. The button uses font called “Sansita One” from Google font. Just some simple CSS buttons for the refinement. Another set of Social buttons created using CSS3, it uses :before and :after to create the button itself. The icons are from fontawesome.io. A series of simple CSS buttons. They are easy to customize and use. Can easily be integrated with Font-Awesome or other icons library to bring it out more. Simple poker chip button example using CSS3, Can also be used as a button with hover effect. Slidey CSS3 button concept, based on Dribble shot by @buatoom. Administration bar (or menu or navigation) with css3 and fontawesome. When toggle on button class active is added using jQuery. A simple button with stitched look, demonstrating the possibility of CSS3, no background image used. Circular button with spinning border for hover indication. A clean soft button created only using CSS3, the button was inspired by this Dribble example. These buttons look like cards that slide out of a sleeve. Useful for teasing a user or for any info that needs to remain hidden until the user chooses. A Pure CSS candybar button animation to denote loading state. Nicely created CSS3 On/Off Switches created using CSS3, uses small jQuery code to toggle class. 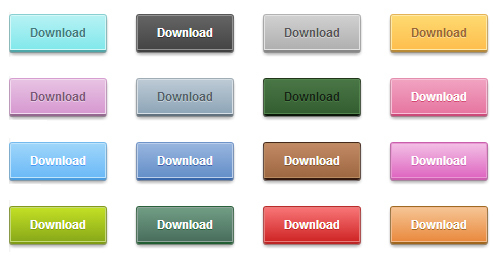 Set of glossy css3 buttons, uses various CSS3 properties to give it 3D glossy look. Pure CSS3 buttons with multi color button edge.